The number one consumer benefit for all golfers is distance. By utilizing the multi-layer construction, the new Strata Professional Distance provides avid golfers the added distance they are looking for off the woods and long irons, and added spin for accuracy on the short irons. I like the distance and how the ball holds the greens and putts. My complaint is the Cleveland AP2 irons chew up the cover..I can see it in my irons grooves. I use them for one round only to use them up so I can buy Titleist Pro V1's. I hope they change the cover. I was very shaky on trying this ball. My wife brought them home to me, for $10 a dozen. we are trying to save money just like everybody else. She calls me a golf ball snob because i only like to play with the most expensive well known ball. I usually use any three piece ball and am happy, however they carry that price tag. Anyway I played with the STRATA the other day and was extremely shocked as to the performance. I noticed just as much distance, and the ball seem to have more control in the air. Even when I miss hit one that felt as though it was going to get away it seem to stay more on target.I also noticed a soft feel on putts. Long story short I shot a 75 that day... I am usually about a 10 HCP. so needless to stay the STRATA is my new ball. Maxfli REV, Black, Tour Fire. I came to this review site hoping to find some critiques of the "new" Strata Pro Distance Ball. I've been playing the original Strata Professional Distance for three years. Becoming aware that Strata was making some slight cosmetic changes to the ball this year worried me. I have lost more than one excellent ball to "improvements" over the last twenty years. I have played many types of golf balls from premium spin balls to economy distance balls. One thing that has been very clear to me over the years is that most Missouri golf courses must maintain two conditions to keep from losing fairways and greens during the heat of the summer: Fairways are rarely mowed tightly, and greens are usually soft from liberal watering. These conditions negate many of the individual characteristics of premium priced balls. For these reasons, I've always tried to play a good quality, soft feeling, mid-trajectory ball that wouldn't take a lot of side-spin off of my overcooked drives. For the last three years that has been the Strata Professional Distance. With this ball I have been able to produce piercing drives of very good distance. I am a high ball hitter, so I've been able to back up the Strata on the green with irons from 8 on down, and make the mid irons stop close to where they land. Long irons have a bit of roll on the green. I know that, so I count on it. For the short game, the ball puts better than anything I've ever used. After switching to the Strata, I started to feel that I could hole everything within reason. Your can count on some consistant roll on short pitches and chips. 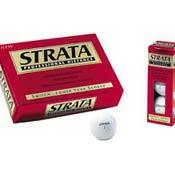 The Strata Professional Distance has been a very good ball for me. I still have over two dozen of the originals left to play. Knowing that the ball has possibly been changed coaxed me to test some new premium balls that my buddies gave me to try out (the same guys who regularly get beaten by my old Wal-Mart distance ball). I hope to be sticking with the "new and improved" Strata Pro Distance. So get out there and review it for me. I have tried literally every premium ball on the market and I have never been able to find the perfect ball for me and my game. That is, until now. I am sold on the new Professinal Distance Strata. It performs better, in my opinion, than the Maxfli Revolution or A10,The Callaway Rule 35 Red, the Srixon Hi-Spin, and even the Pro-V1 and Strata Tour Ultimate. It has exceptionally long, straight distance combined with a new soft, balata-like feel for control around the greens, and it putts better than any ball I have ever used. It does not spin quite as much as some of the "tour balls" but that makes it much more accurate off of the driver, fairway woods, and long irons. The ball, after all, does not know the difference b/t good spin into the green and bad spin (i.e. slicing side spin). The angle of descent on the lower irons makes it stop well also. It may not spin back 10 feet, but how many of us want that to happen anyway. You can really feel the ball on your club during chipping and putting, which makes it superior to many of its softer counterparts. Do what the ad tells you, "Switch and lower your scores!" Callaway Rule 35 Red, Maxfli Revolution, Maxfli A-10, Titleist Pro-V1, Srixon Hi-Spin, Strata Tour Ultimate. The Pro Distance is a great all around performer. I can spin it just as much as a tour ultimate and it goes just as far. The tour ultimate feels better but aren't results more important that feel? I only shoot in the 80's so I'm just beginning to see different results from using different balls. Untill I break 80, the Pro distance is the best for me. I did not find these balls to be much different than the XL-2000 Extra Longs that they came with. The biggest difference that I found was that the Strata was slightly, and I mean slightly softer in feel at impact. The distance was similar to other distance balls and obviously, as with other distance balls, stopping on greens is not the strongest suit. Excellent off the tee. Pretty good feel with putting. Low spin and do not hold green unless dropped in from a mile high. For half the cost you can get better performing XL 2000 or Srixon soft feel.